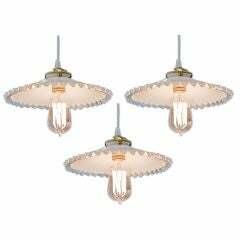 A handsome French three-light hanging light fixture or chandelier (18 inches diameter) of gilt metal featuring a lotus leaves or layered leaf design, with down-facing finial. U.S. wired, Ready for display. 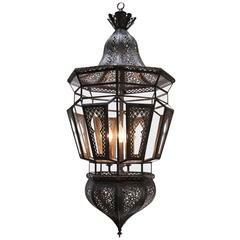 This industrial yet elegant hanging lamp from the 1940s features a Holophane glass shade. 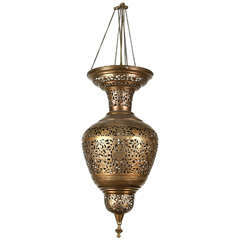 The pendant is connected by an aluminum casing fixed to the top of the light fixture. 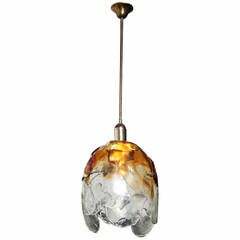 In three large handblown pieces of clear and amber glass, this upside down large tulip light fixture gives great light and beauty to any space by Carlo Nason.